Why are Say “Alaka‘i” postings duplicated on Talking Story? Every Tuesday and Thursday I write on management and leadership for the Say “Alaka‘i” blog at Hawai‘i’s newspaper, The Honolulu Advertiser (Why me? Learn more about me at RosaSay.com or the Talking Story About Page here). I will often duplicate those postings here on Talking Story for those who wish to discuss them within our Ho‘ohana Community environment instead. This is a practice I have learned to adopt for any guest posting I do which is outside my own Ho‘ohana Publishing ‘Ohana of publications, and not solely for The Honolulu Advertiser, for a critically important reason: I stake my reputation on consistent value alignment with the nineteen values of Managing with Aloha, and Talking Story is the living laboratory and thriving community ecosystem of our MWA web-based culture. I have great admiration for the writers and editorial staff of The Honolulu Advertiser ”“ if not, you would not find me there. I personally moderate all comments received on Say “Alaka‘i” and I apply the same zero-tolerance I have on all Ho‘ohana Publishing sites in regard to spam and negativity which does not uphold the Aloha and Ho‘ohanohano of honorable discourse. I do not expect everyone to agree with me, and in fact, I enjoy being challenged for the sake of my own learning and growth, but I do expect the behaviors of mutual dignity and respect regardless of the topic or emotion evoked. I have now published community forums online for several years, and I have come to believe that many who are ready to call themselves members of our Ho‘ohana Community prefer, and thrive in the conversations we have here which tend to be much more open, transparent, and with the familiarity and professional demeanor of an ‘Ohana in Business. I want you to feel comfortable enough to comment without hesitation. 1. Convenience: Email subscribers can get both Talking Story and Say “Alaka‘i” by merit of just one Feedburner/Google-mailed subscription instead of two, and as compared to RSS, those emails make printing and forwarding within work teams much easier. 2. Archiving Integrity: I am always happy to do guest posting elsewhere as I am able to, however I believe I serve readers better by holding myself fully accountable for the archiving of everything I write. The web has a long memory, but it does not magically correct broken links, and that can happen for a wide variety of reasons. Blog ownership will change hands, and publishing practices will shift elsewhere as a result. If my name is on an article, you can always write me to eventually find it. 3. Continuous Learning: I began to write Say “Alaka‘i” in November of 2008. Our Ho‘ohana Publishing Community embarks on our sixth year in August of 2009, and we have a history of sequential and consequential learning within the Managing with Aloha movement. Therefore, the Talking Story edition of my posts will often have additional links to past discussions here or on Managing with Aloha Coaching and Joyful Jubilant Learning. In contrast, I believe I should afford The Honolulu Advertiser my respect and support with keeping the reader there within that family of blogs and not excessively linking elsewhere. Here is a link to the very post I had written there: What is “Say Alaka‘i” all about? You can identify my postings for Say “Alaka‘i” easily: You will see the blog name show up here in the byline directly under the post title. I will mix it up at times, but usually I write on leadership each Tuesday, with a related management follow-up each Thursday. When we make the decision to commit to the values we’ve articulated and deliberately chosen, we do so understanding our decision will make a contribution: It will shape the character of our community. Values are the construct of our culture. Values drive our behavior, and their pervasiveness (or their absence) will define our sense of place. Shared values will determine our conversations; and those conversations articulate the thoughts we once held privately within the confines of our own beliefs. We share them with others who will either dispute and negate them, or embrace and enroll in them with us. 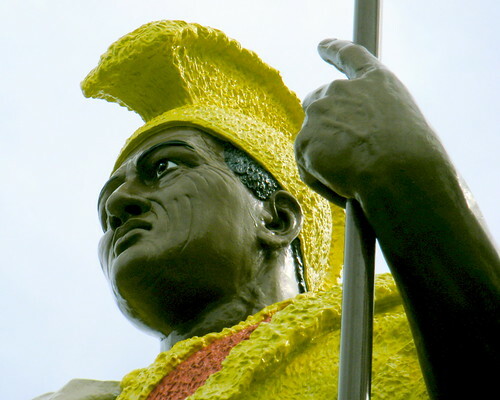 —Kamehameha’s Legacy of Values—Read more there, and learn about the Alaka‘i values King Kamehameha the Great chose for his rule. Duplication can happen, but it isn’t routine! There are other times we have different conversations going here on Talking Story, and we don’t stop just because it happens to be a publishing day on Say “Alaka‘i.” We ho‘omau (continue with our talk story) and I will publish in both places! I will also write for Say “Alaka‘i” as a “Hawai‘i citizen publisher” thinking about “my local” and sense of place there, and those very-specific-to-Hawai‘i editions are not duplicated here. Mahalo nui loa, thank you so much for reading.